One thing I've never had the pleasure of doing is eating at a carhop. In fact, I don't ever recall a notable one existing in the Boston area by the time the 70s and 80s came along (although I'm sure at least one reader will let me know if that wasn't the case.) 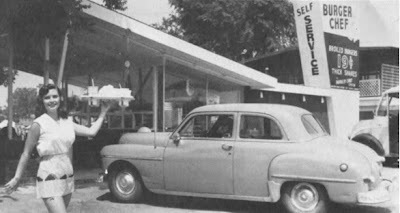 Carhops started popping up in the 30s as a dining response to a new automotive world and had taken off by the 50s. 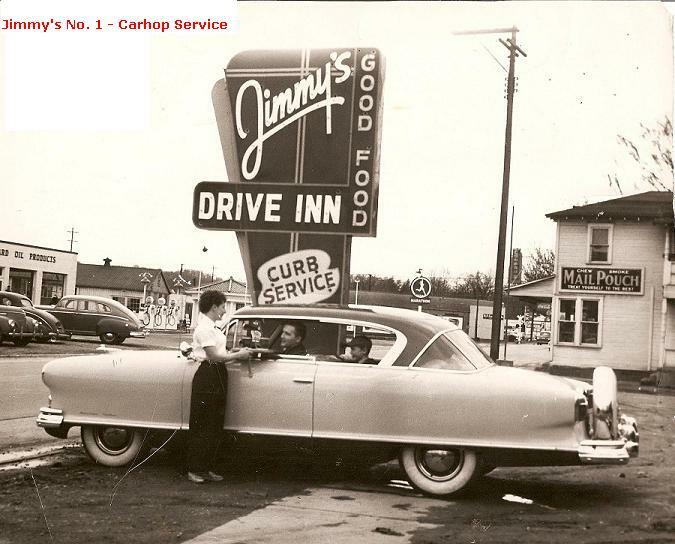 At carhops, you'd pull your vehicle up to a designated parking spot and never got out of it. Waitresses, usually on rollerskates, would take your order and bring you your food. If you've seen the movie American Graffiti, a carhop is featured prominently in the film. 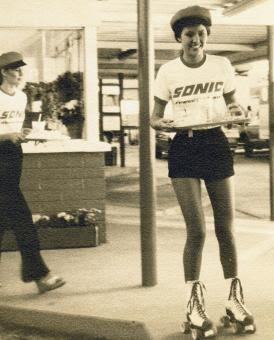 Considering how sedentary our society has become, it's surprising that carhops peetered out over the past 30 years. 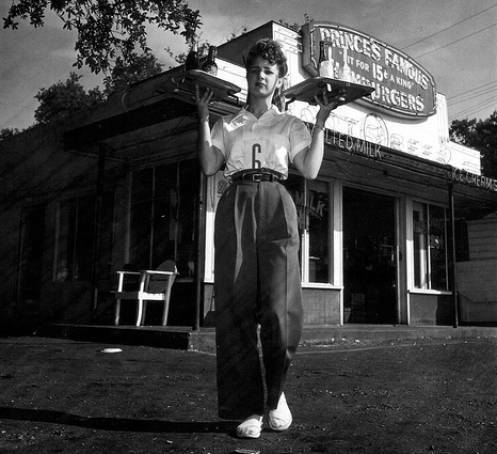 Now two restaurant chains, Ruby's Drive-In and Sonic Drive-In, are bringing back the carhop atmosphere and putting their servers on rollerskates. Both chains are hoping the retro twist will attract diners away from McDonald's and the usual fast food chains. It's a great idea, and I hope one opens in my area soon. In the meantime, here's a collection of vintage photos of original carhops. And if you have fond memories of visiting one, I'd love to hear about them. I love that this photo shows that not all of the skating servers were girls. Why should male customers have all of the fun and eye candy? This one's from 1945...a little more modesty because of the trousers. Love it...love looking at these old photos. I am all for having car hops today...but wonder if liability insurance and workers compensation insurance will push it back into the past. And hope there will never be a "Hooters" car hop serving up beer. Good point, Sassy Lassies Vintage Life. The idea of a Hooters car hop gives me the heebie jeebies! Enjoyed those old photos - thanks! I'm all for it. 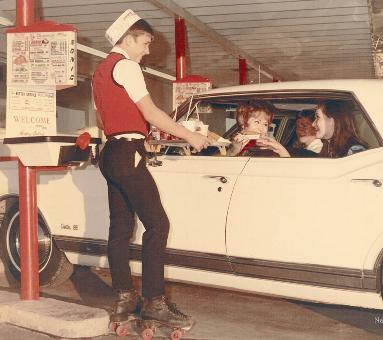 Glad Ruby's is 'hopping' on the drive-in bandwagon and putting carhops on rollerskates. Will have to visit one the next time I'm in LA. I've never been to one either but I think they should bring them back! I've never heard of Ruby's, but i've been to Sonic plenty of times. Their food isn't really all that great, unfortunately, but i've always enjoyed car hops. We used to have a small chain called King's Drive-In from the '50s-70's and they were gone for awhile, but a few of their restaurants came back in the 90s and now they've even got hops at one again. They're trying! And hey! What about even bringing back rollerskates? I've lamented the loss of arcades, roller rinks, record stores, car hops and drive-in theaters for years. Video stores are next on the extinction list. Netflix and the like are convenient, but somehow i'll miss perusing those aisles. I would love to see a carhop in Toronto! Unfortunately it would be a very seasonal undertaking...can't imagine rollerskating in the snow! Totally agree, Jacko - I loved my rollerskates back in the day and actually wouldn't mind having a pair again, and I mean the sneaker kind with the rubber toestoppers, not roller blades. How I looked forward to the 15 minute recess break so I could use them. They were so much fun. I should do a post soon about arcades or record stores - thanks so much for the ideas! Thank you, Some Like It Vintage! Haven't had the chance to use the casserole yet, but it's awfully cute. Hey, this is Go Retro, isn't it? Of course the real rollerskates! I still hear certain songs and immediately associate them with my experiences at the roller rink. Same thing with drive-ins and arcades. Certain foods and sounds take you back. All people measure things by now is the convenience factor. But you really experienced those places when you were there. The sights, the sounds, the smells. Sort of like a fairground or carnival, each had it's own essence about it. We've outsmarted ourselves, figuring out ways of getting everything at a moment's notice, delivered to your door or streamed or downloaded, but we've lost something in the exchange. I've always thought it would be so much fun to go to one of these! You found some really great photos, too. Sorry I haven't been commenting much...school, graduation madness, interning, general craziness...But I'm trying to come back! 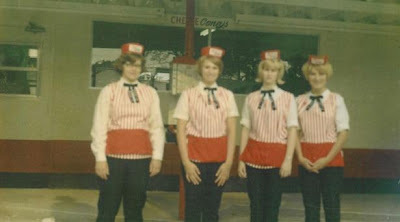 I worked at Adventure Carhop, in Saugus MA, in 1963. No roller skates. I shudder to think how many trays full of food would have ended up on the ground! 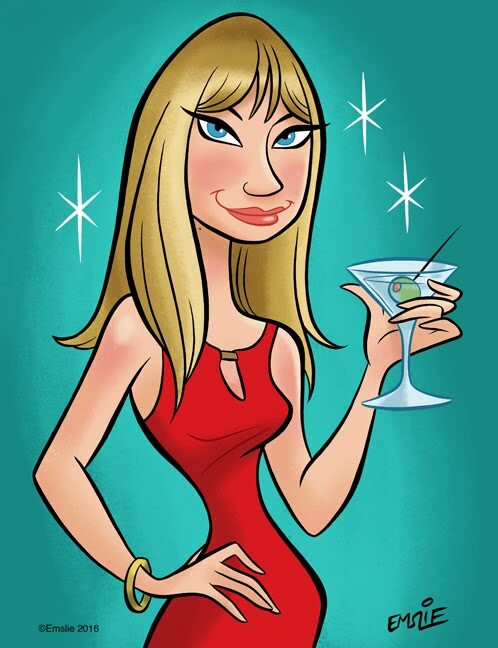 At Adventure, if a customer ordered the "item for the day" and said "Woo-woo Ginsberg (a local deejay) customer received a double order. Up until MacDoald's put it out of business...1994 or so...there ws an A&W carhop in Marshfield, MA. When the A&W drive-ups shut down, this place just changed its name...but continued to serve A&W root beer. And they had the best fried clams and onion rings, ever! I understand the food at Sonic isn't all that great, but whenever I go by one, I have the urge to stop in. There were still carhops at Stewarts in the 70s and early 80s that my family and I went to sometimes. It was cool eating in the car like this. I loved those photos - makes me want to go to such a place again. Great article, but as a constructive correction, the establishment at which one dined from one's auto was/is known as a drive-in. The Car hop is the server, the person who brought/brings food to the diner in the diner's auto. So one wouldn't dine at a car hop. One would be served by a car hop while dining at the drive-in. Car hops are thought to have gotten their name from the early practice of the server hopping onto the running boards of the automobiles entering the drive-in.